You’ve spent many years working and saving, so you can enjoy your golden years. And now that you’ve officially retired, you’re finding it hard to stay active, which is common when we fall out of routine. Pine Hills Retirement Community in Hot Springs, SD, is an assisted living facility offering the best amenities and activities for seniors. 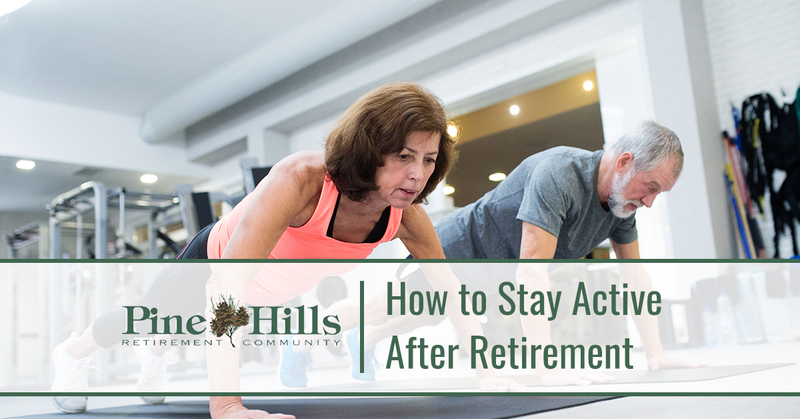 Below, you’ll find our tips on how to stay active after retirement, and if you’re interested in independent living, contact us today! Get social. With retirement, you’re free to do whatever you want, whenever you want. But without the network of colleagues whom you see on a daily basis, maintaining friendships can be challenging for seniors. One great way to keep active after retirement is to go places and do things with friends. You can play pickleball, which will get you moving, get your heart rate up for cardiovascular health, and get you outdoors, enjoying the beautiful world you live in. At Pine Hills Retirement Community, we regularly host special events, celebrate holidays, offer crafts, arrange outings, and bring in engaging speakers — all opportunities for you to meet friends and just hang out. Plan exercise. As seniors, staying active is important — only with caveats. The bones of seniors are more fragile as you lose bone mass and density as you age and muscle tissue is lost. Lean body mass decreases, and joints can break down. That being said, this doesn’t mean you shouldn’t do anything; it just means you stay active smarter. Go for brisk walks in the mornings or evenings. Take group exercise classes (SilverSneakers® is a great health and fitness program designed for adults over the age of 65) to decrease the speed of muscle loss. Go swimming, which is low impact on your bones and joints, but a great cardiovascular activity. At Pine Hills Retirement Community, we are located in the beautiful Black Hills of South Dakota where nearby are trails for walking, biking, and hiking are available, and a golf course sits right outside your door. We encourage our residents to stay active for their needs. Learn a new skill or hobby. Studies have shown that you can help prevent cognitive decline, reduce the risk of dementia, and help increase your memory skills by learning a new skill. Crossword puzzles are one way to keep your brain active. Play a game such as chess, checkers, and card games. Take a course or read books on new subjects. For example, did you always want to know about all the battles of the Civil War? How about the Bolshevik Revolution? Did you ever wonder how Excel works? Enroll in a class or pick up some great books from the library. Pick up golf. Golf is about strategy and will challenge your mental skills as well as get you outside and active as well. Yoga will do the same thing. Pine Hills Retirement Community in Hot Springs, SD, is passionate about providing a great assisted living facility for seniors. By providing amazing amenities such as a golf course and swimming pool, nutritious food, and community activities, Pine Hills is a great place to enjoy your retirement and stay active — both physically and mentally — so your golden years are pleasant and enjoyable. Contact us today!